CRAVAT BANDAGE FOR AXILLA (ARMPIT). This cravat is used to hold a compress in the axilla. It is similar to the bandage used to control bleeding from the axilla. Place the center of the bandage in the axilla over the com-press and carry the ends up over the top of the shoulder and cross them. Continue across the back and chest, to the opposite axilla and tie them. 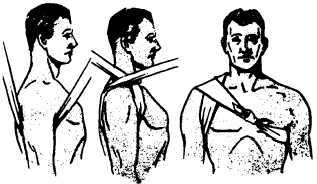 Do not tie too tightly or the axillary artery will be compressed. adversely affecting the circulation of the arm (fig. 4-44). 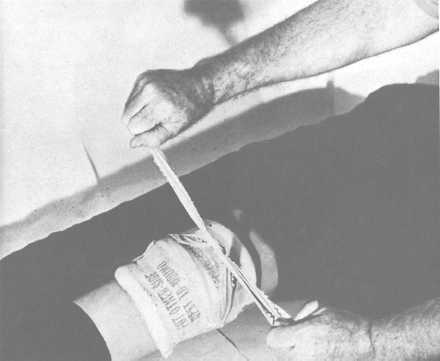 Figure 4-44.Cravat bandage for the axilla. A battle dressing is a combination compress and bandage in which a sterile gauze pad is fastened to a gauze, muslin, or adhesive bandage. Most Navy first aid kits contain both large and small battle dressings of this kind (fig. 4-45). Any part of a dressing that is to come in direct contact with a wound should be absolutely sterile, i.e., it should be free from microorganisms. The dressings that you will find in first aid kits have been sterilized, However, if you touch them with your fingers, your clothes, or any other unsterile object, they are no longer sterile. If you drag a dressing across the victims skin or allow it to slip after it is in place, the dressing is no longer sterile.